Snowshoeing is growing fast in popularity and Seefeld is one of the best places in Austria to try it out. It has a whole range of marked snowshoe trails for those who don't like to go too far from civilisation and in the Wildmoos it has an elevated area at the heart of the plateau which is free from the kind of avalanche worries in higher steep-sided valley. Here snowshoe walkers can hike trails and forestry roads which are usually walking tours in the summer but uncleared in the winter. 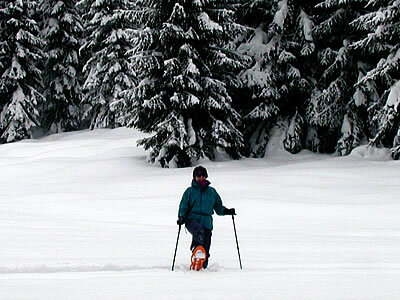 We have an extensive range of snowshoes for hire or sale. 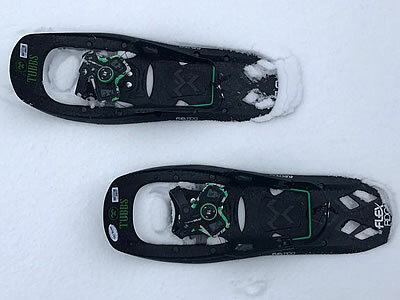 Many of the rentals and all of our stock for sale are from the renowned Tubbs brand of snowshoes, with the higher end equipment having the ultra-convenient snowboard-style binding, as in the picture below. We include snowshoe enthusiasts - as well as a qualified snowshoe walking guide - among our staff and will be happy to advise any visitor looking to try out or take up this fast-growing sport. Save 10% and book your winter sports equipment now!